You read so much about what is good for you and what is not. Doctors tell you one thing and then years later you find out that thing isn't really good for you and 9 times out of 10 causes cancer so what is one to do? Shortening, margarine, & etc are said to be one step away from plastic and therefore not as good for you as animal sources now. Who knows and what is one to do? "When a square of butter and a square of margarine were put into a baking pan, then insects (ants/flies) were added, they went to/landed on the butter. This tells you that nature chooses real food!" credit That is enough for me to sometimes use a little lard and I know I will use my butter. I'll tell you that I've limited my use of shortening and never use margarine anymore. Animal sources are not as healthy as in the past either because grandma and grandpa raised their own animals and they were much healthier. If you know me you know exactly how I feel about animals grown in CAFOs. We don't all have the ability to raise our own food animals now so we must buy. 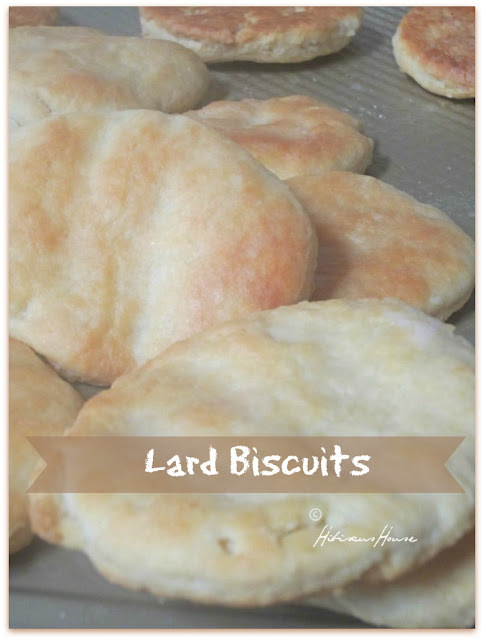 I still think even though saturated fats are said to be unhealthy I will use some every now and then and for these biscuits today I am using lard. Let me tell you if made gently with a light hand they will melt in your mouth! I am making the very thin tiny biscuits similar to what locals around here know as 'Mr. B's Biscuits"
I really like King Arthur Flour, it has been around for a very long time and is unbleached. White Lily is a good substitution and then Southern Biscuit Flour, those are my choices. Look at my very old sifter, no red knob, older than dirt but works 100% better than newer ones. The biscuit cutter is old as well, check out the little red bent handle. 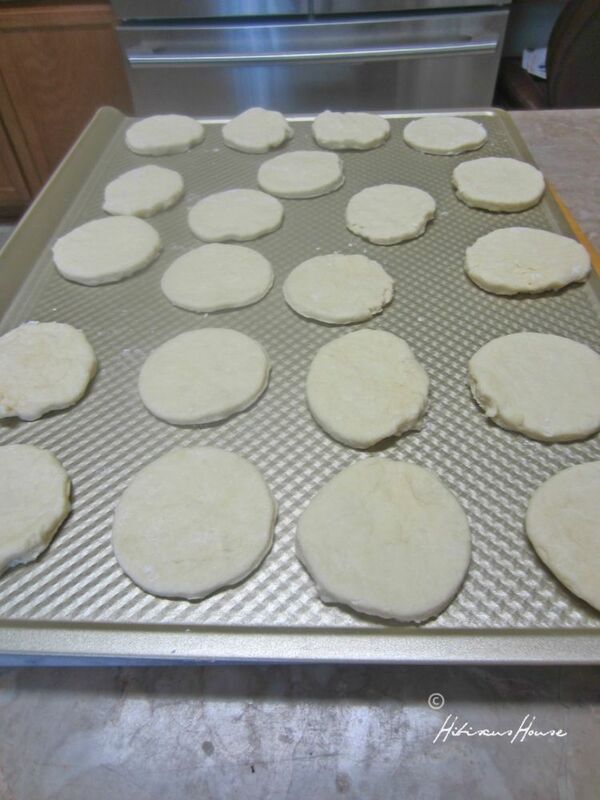 Roll these tiny biscuits no thicker than 1/4 inch. Today I rolled them but I'll have to say the best way is to make them with your hands like grandma did. Tender touch and handling of the biscuit dough that is what makes the delicious melt in your mouth, flaky, texture. The USA GoldTouch Pans are the best in the world and made right here is USA! One exception for me I do have a favorite bowl but I wash it each time I use it. One day I'm gonna get a wooden bread bowl and then it won't be washed each time. Don't want to use lard you can use shortening, butter, oil even olive oil, but you will get different textures and taste. Wait for oven to get hot so your biscuits will bake quickly and beautifully. Place your oven rack one level above the center to promote better browning. If bottoms brown too quickly then place broiler on and watch constantly to brown the way you like them. Hand rolled make the most tender biscuit! 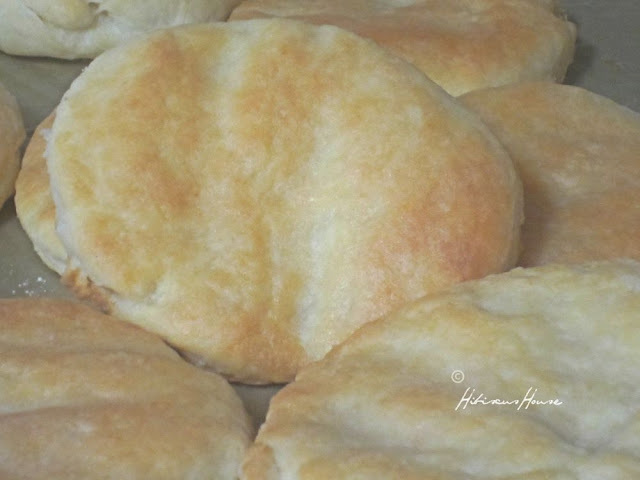 The dough cutter puts the butter or shortening into the complete flour mixture in the pan and is good but to me the absolute best way to make a pan of biscuits is the Hand mixed Hand Rolled method. Take your fingers and gently 'squish' the lard with the milk to break up and mix thoroughly. This should be smooth when you finish. The next step is to incorporate the flour, do so gently, as if you are folding the flour into the milk. Gradually take you hand and go around the well mixing in a little flour in at the time. This part is sort of like you are gently folding in flour as you go. Do this until you have the flour mixed in around the circle building your dough ball as you go. You should use all loose flour into this mixture. 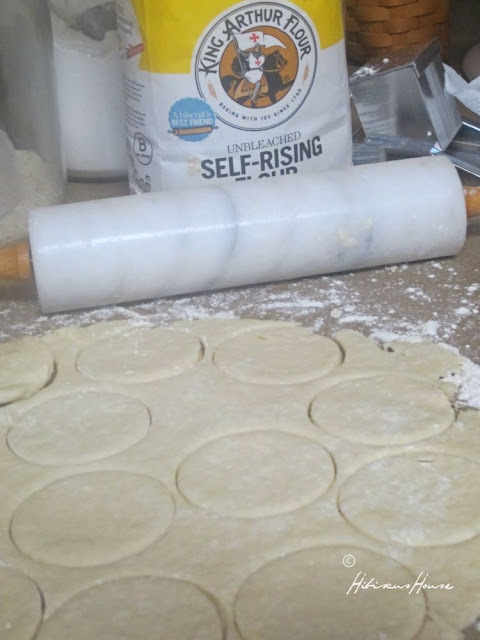 Shape dough gently into a long roll type, being careful not to overwork it, because that will make your biscuits hard and tough. Pinch off a piece of dough approximately 1 1/2 inches long. 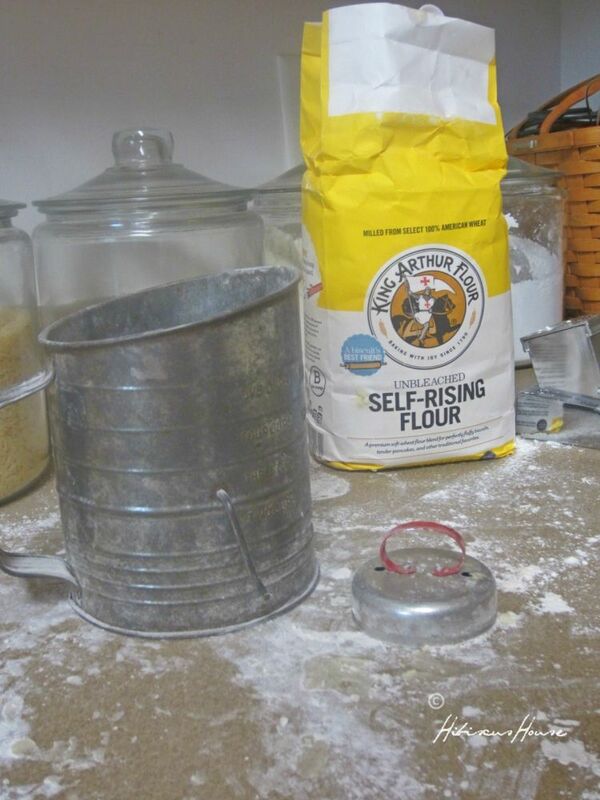 Put flour into the bowl next to the dough for using on your hands. You will want to keep your hands coated with the flour. 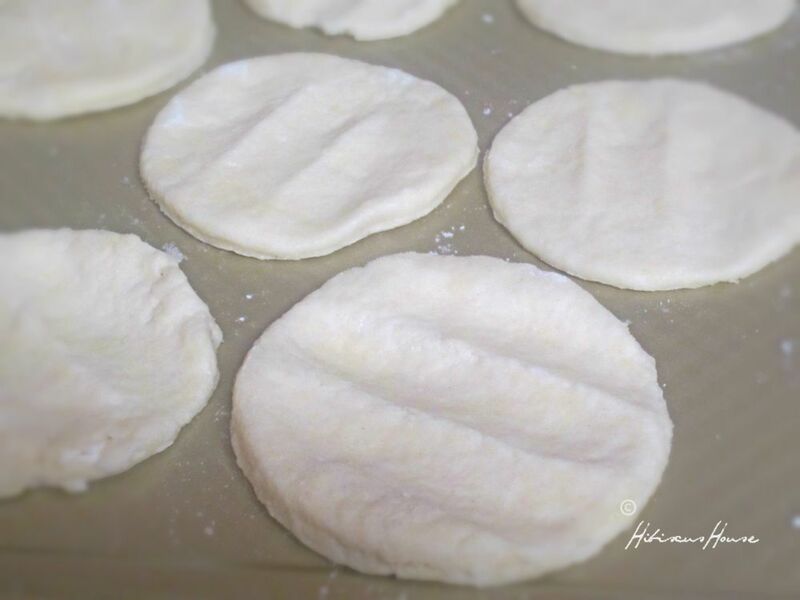 Gently roll the small sections of the dough into a circle in your hand. Place the biscuits on an un-greased baking sheet touching on pan for tender pull apart biscuits or 2" apart for crisper biscuits. 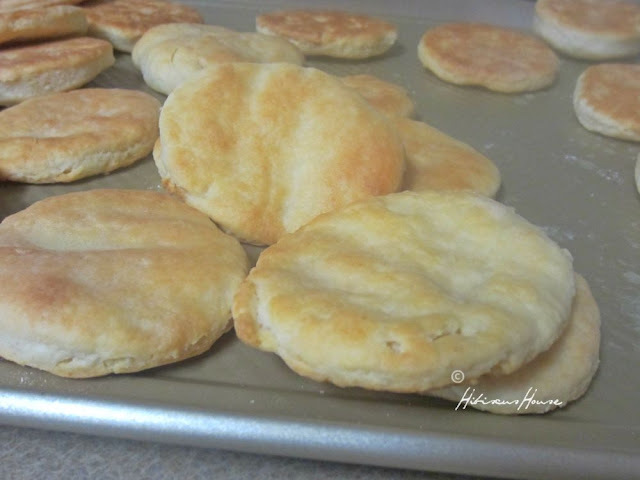 Pat/press your floured fingers into the biscuit. Bake 10 to 13 minutes Browning slightly being careful not to burn the bottoms. Remove from oven. Serve Immediately. If you have a few minutes before serving, then I suggest you turn biscuits over and cover with a tea towel. That is how my grandma Cora did she said, "That prevents the biscuits from sweating so bad." I'll leave you today with an adorable video below of a lady named Ola Fowler. She makes them similar to how we do. I mix my shortening/lard together with all of the milk at first for smooth dough, she mixes a little milk in at a time and begins incorporating her flour into her dough right away. My method works well for me but I'm going to try hers as well. Enjoy the video it should give you a better idea anyway as to how to make them the "Old Fashioned Way." Isn't she precious? This little lady. Love the video. I've shared a few tips from my grandma and a Simple Southern Tradition! That was the baiscuit song that used to be song above when I was little girl. Do love homemade biscuits!!! I know, we love biscuits, don't make them much but sure do love them. I love that biscuit song!